Case 1. Temperature 30 degrees Celsius (86 degrees F) due to environmental hypothermia. There is very slow atrial flutter (rate = 167) with 4:1 AV conduction. There is a wide QRS with a very large notch (in this case, a hump), or J-wave, at the end. This is the classic Osborn wave of hypothermia. Sinus rhythm. Long QTc [about 500ms; the computer read 180ms (!)]. There is ST elevation which alarmed the residents. I did not think it looked like injury. 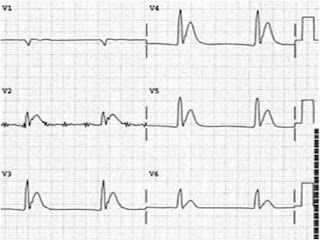 There are J-wave notches at the end of the QRS, particularly in V3, which are rather large for early repolarization, which should make one think they may be Osborn waves. I asked about the temperature. No ST elevation, and much smaller J-wave notching, seen best in V4. A rectal temperature was 30.8 degrees Celsius. J-wave notching persists but is much smaller. Rhythm: The most common rhythms in hypothermia are sinus bradycardia, junctional bradycardia, and atrial fibrillation. Shivering artifact is common. Atrial flutter is seen in case 1. At temperatures below 30 C, the patient is at risk for ventricular fibrillation. In this study of 29 humans cooled to 28-30 C for cardiac surgery, 19 developed atrial fibrillation and 2 ventricular fibrillation. 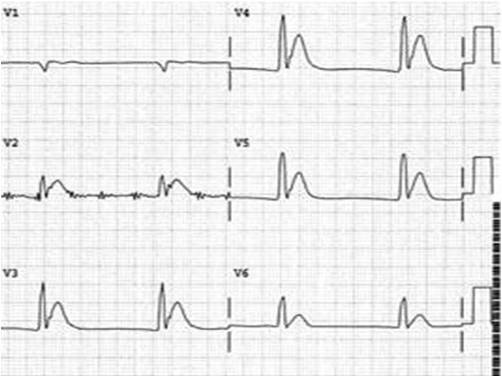 QRS: Osborn waves are thought to be pathognomonic of hypothermia, but can also be seen in normothermic patients. "J-waves" or "J-point notching" is very common in early repolarization. Very narrow Osborn waves were reported in severe hypercalcemia (level 16.3). Sometimes a short ST segment of hyperCa can be misinterpreted as an Osborn wave (see image below); that is not the case in the aforementioned case report. J-wave syndromes are proposed to give a unifying pathophysiology to Osborn waves of hypothermia and early repolarization, as well as Brugada syndrome. Very large and wide J-waves, as in case 1, are almost exclusively due to hypothermia. The etiology is beyond the scope of this blog, but may be read here. Hypothermia and pseudoinfarction patterns: MI or ischemia (either ST elevation or depression) may be mimicked either by 1) repolarization abnormalities (As in Case 2, with ST elevation) or by 2) confusing the J-wave with the ST segment, as in this case in JACC (full text) and this case in Archives of Internal Medicine (no full text). This latter case also has ST segment depression as a repolarization abnormality. This image courtesy of Dr. K. Wang from his Atlas of Electrocardiography. The major difference between the Osborn wave and the example of hypercalcemia is that the Osborn wave is followed by an ST-T complex, while the wave directly following the QRS in hypercalcemia is the T-wave itself. Thanks for another interesting case Dr. Smith. 2 questions a bit off the topic though, I noticed the computerised QTc was way off in case 2. Do you put as much faith in the computerised QTc as you do with the computerised interpretation of the ECG? And how did the inaccuracies of computerised QTc measurement affect your equation for the LAD occlusion vs early repolarisation? I should have written, "whenever it IS long..."
How to differentiate j wave and left bbb ? J-wave is a second wave. Very different. Send me an image of Osborn waves in head injury. I'm skeptical that they are really the same. Hi Dr Smith, would like to ask how to differentiate epsilon wave in ARVD and osborn wave if merely based on ECG? how do we differentiate it with the J wave seen in BER? The best way is by taking the temperature!